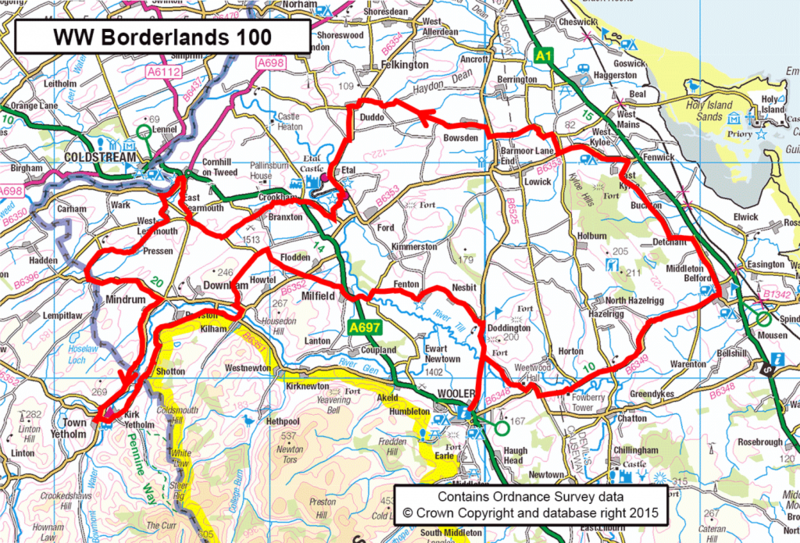 The WWB100 follows the same route as the WWB170 and WWB60 for the first 29 mile which includes the challenging climb up Lyham Bank followed by a segment running parallel to the coastal AONB giving marvellous views of Budle Bay, Holy Island and Lindisfarne Castle. The WWB100 and 170 stay together for a further 6 miles’ and then split after the feed station at Cornhill. At Town Yethom the WWB100 merges with the WWB170 and crosses the border a few miles north of Kirk Yetholm. The route follows the hilly road to the south of the Bowmont Water to Kilham where it strikes north to climb the steep Thornington Bank followed shortly by a strenuous climb up to Flodden Edge (too strenuous for some at this stage of the ride). The final 10 miles into Wooler are an exhilarating descent into Milfield followed by a fast traverse of the Milfield Plain. Don’t forget to allow a few minutes at the Doddington Dairy to reward yourself with one of their delicious ice-creams.